The Wilsonville Wildcats were wearing their hitting shoes for Friday's home game against La Salle Prep. Wilsonville's Cole Kleckner went 2 for 3 with a double, a triple and three RBIs as the Wildcats unleashed an 11-hit attack — seven for extra bases — and rolled to a 12-7 Northwest Oregon Conference home win over the Falcons. Nolan Thebiay added a pair of doubles and two RBIs, and Jack Kimball chipped in a two-run triple as the Wildcats (4-7, 1-2 NWOC) spoiled La Salle's bid for a three-game series sweep to open league play. How badly did Wilsonville need this one after losing the first two games of the series? "A win's a win," said junior Jarrod Seibel, who went 2 for 2 with a double and three RBIs. "We didn't really need anything. We just played as a team and came together tonight. That's all that really happened. "Our bats were more alive, we had more intensity in the dugout, we were making plays in the field, and all around it was just a really good, clean game on our part." At the same time, it's better to start league play 1-2 rather than 0-3 when you're ranked No. 4 team in the coaches' poll and the preseason favorite to win the league, isn't it? "I mean, I guess, but this was just us coming together a little bit," Seibel said. "It wasn't about the losses. Yeah, losing hurts, but we got the win tonight, and that's what really matters." The game was tied 5-5 in the fourth inning when Wilsonville sent eight batters to the plate and scored four runs on two hits, three walks, and two La Salle errors to take a 9-5 lead. The Wildcats broke the game open in the fifth when Cade Edmondson and Andrew Classen scored on Kleckner's one-out triple, and then Kleckner came home on Seibel's sacrifice fly to right, pushing the lead to 12-5. La Salle (2-7-1, 2-1) scored two runs without the benefit of a base hit in the seventh inning when Robby Collman and Jace Norton each drew bases-loaded walks, but the Falcons left the bases loaded when Matt Evans grounded to second to end the game. "Give Wilsonville credit," Falcons coach Nate Fogle said. "They hit the heck out of the ball today. As much as it's on us first to play a little bit better, they came out and outplayed us today, so give them credit." 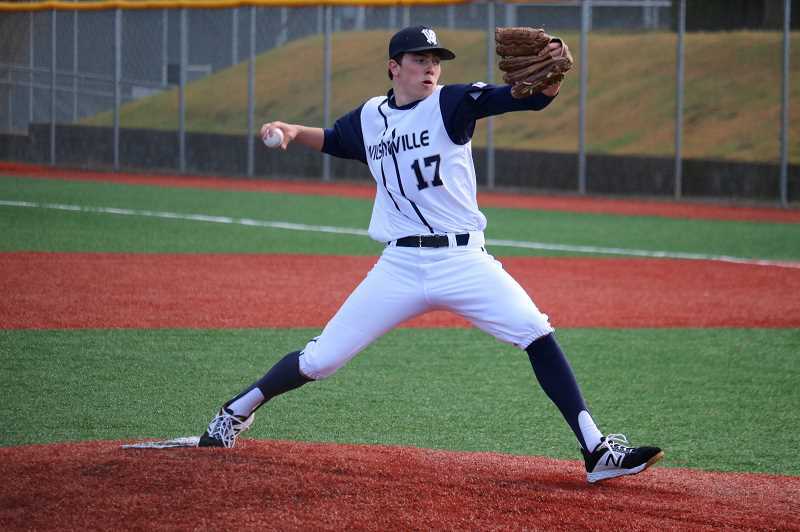 La Salle had all the momentum heading into Friday's series finale after winning Tuesday's opener 6-2 at Wilsonville, and then turning around and taking Wednesday's second game 3-1 at La Salle. 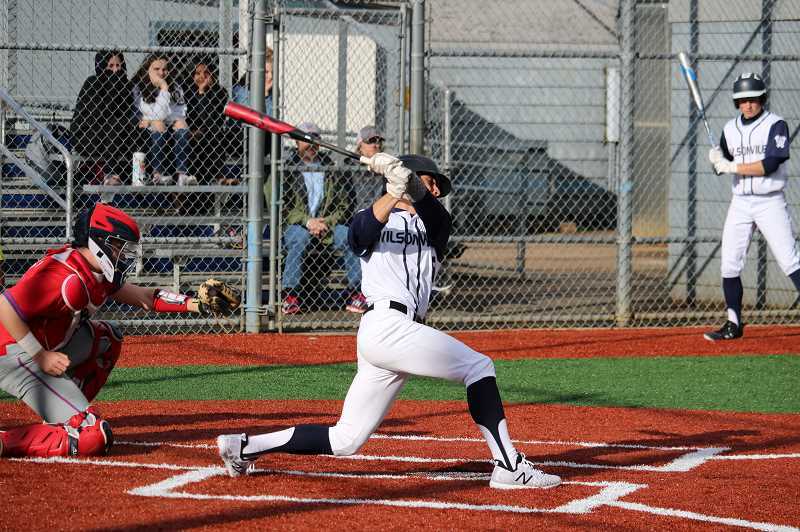 The Falcons got off to a strong start Friday, too, when Evans got hit by a pitch from Wilsonville starter Keegan Shivers to lead off the game, Nolan Grogan drew a walk, and Gavin Gately drove the first pitch he saw over the fence in left field for a three-run homer. "It was a fastball down the middle," Gately said. "I just got a new bat — a DeMarini one-piece Voodoo Drop 3 — and I just wanted to swing it." La Salle's Patrick Raschio and Isaac Kersey-Bronec added two more hits in the first inning, but the Falcons took themselves out of the inning with a base-running error at third base for the final out. The Falcons had only one other hit in the game — Norton's leadoff single in the second — but that's not to say they didn't have plenty of other scoring opportunities. Wilsonville used four pitchers — Shivers to start, then Christian Aguilar, Andrew Classen, and Seibel to finish up. They earned credit for tossing a combined four-hitter with four strikeouts, but they also issued 10 walks and hit two batters, which helped keep the Falcons in the game. The Wildcats had a 5-3 lead in the fourth when Shivers plunked Kersey-Bronec with a pitch, then walked John McQullin, Norton, and Evans to force in a run. Aguilar then took over on the mound and walked Grogan to push home the tying run, but escaped further damage as he retired Gately on a grounder to third and then got Spencer Paugh on an inning-ending fly out to right. Wilsonville regained the lead in the bottom half of the inning when Trevor Antonson and Kleckner drew walks from La Salle starter Perry Collman, Seibel followed with a bloop single to right, and Antonson came around to score the go-ahead run when the ball got misplayed into an error. Thebiay then drove a 0-2 pitch to the gap in left-center for a double that scored Kleckner and Seibel, and also chased Collman, who in 3 1/3 innings allowed nine runs on eight hits with three walks and one strikeout. The Wildcats then piled on against three Falcons' relievers. "We jumped out to a 3-0 lead and we had all the energy in the world," Gately said. "We were up two games against one of the best teams in the conference and then we made some mistakes. "It's a little disappointing, but we've always got tomorrow and we've just got to keep going. It's a long season. But taking two out of three, that's big. I don't think anyone in the league was expecting that and it just shows that we can play ball. No one should underestimate us." Added Fogle: "We took two of three from a good program, so that's still a win on the series. Obviously, coming out with a 3-0 lead, you'd like to shut them down that first inning and things didn't happen. But I still think we came into the series and did what we wanted to do and that was win two of three."